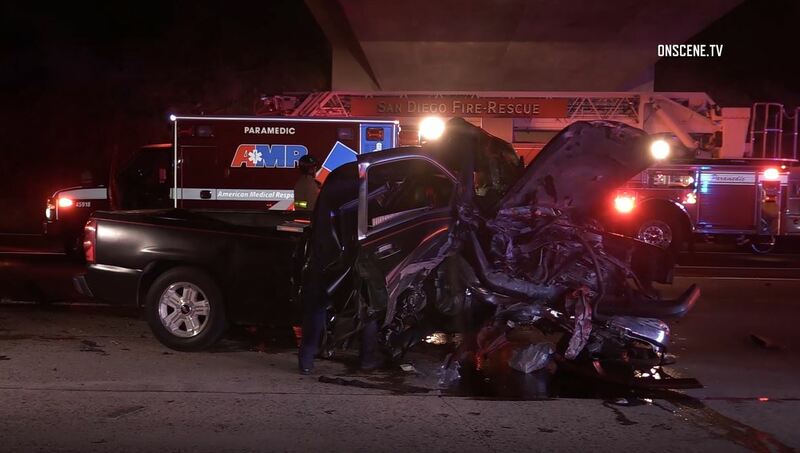 A pickup truck that drove through the San Ysidro Port of Entry and continued north in the southbound lanes of Interstate 5 crashed and critically injured two people late Sunday night. The crash with a second vehicle was reported at 10:15 p.m. on the southbound freeway at Dairy Mart Road, the California Highway Patrol said. The CHP indicated Border Patrol agents were pursuing the Chevrolet pickup at the time of the crash. The driver was suspected of bring drunk as well. Paramedics took two people to hospitals for treatment of injuries, a CHP dispatcher said. Their conditions were not available, however, media reports indicated they were critical. A SigAlert was issued for all but the slow lane of the southbound freeway, the CHP said.